A light and nicely interior designed upper maisonette with own entrance and unusually good sized bedrooms. The maisonette has a good feeling of space with generous halls with large windows. A galleried kitchen / dining room is positioned above the reception room which adds to the cool quirky style of this property and makes for a great entertaining layout. Situated at the southern end of the road on the corner of Jeddo Road, the flat is conveniently close to Askew Road and a few minutes walk from Wendell Park and the local primary schools. Also the shopping and transport hubs of Hammersmith and Westfield are within easy reach; the 607 bus route east along Uxbridge Road provides the fastest access to the Central Line tube. Stamford Brook or Turnham Green Terrace tubes are an approximate 10 to 15 minute walk. 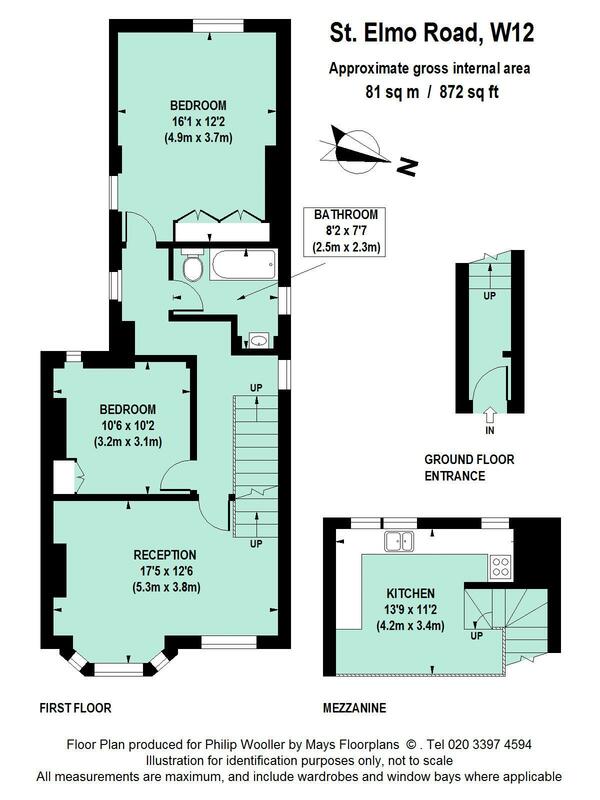 872 sq ft / 81 sq m approx.